SolarCity is having a rough day in the market today, and the activity is the result of a big decision made by the state of Nevada surrounding the solar industry as a whole. Today, we’ll talk about that decision, what we’re seeing from SCTY as a result, and what we can expect to see from the stock moving forward. When it comes to the solar industry, there has been quite a bit of chatter with regard to new changes in Nevada. Earlier in the year, Nevada made the decision to raise monthly fixed fees as well as reduce credits received by solar customers in the state. Unfortunately, this takes value away from consumers who have already invested in solar systems and may cause prospective solar customers to change their minds. As a result, Solar companies, including SCTY made an attempt to suspend the new rules. Essentially, these solar customers were working to keep the cost of energy for solar customers low. Unfortunately, the Nevada Public Utilities Commission voted today, unanimously rejecting the request. As a result, existing solar customers as well as new solar customers will be shifted to the new fee structure. This is a big deal for SolarCity as well as other solar companies in the United States. 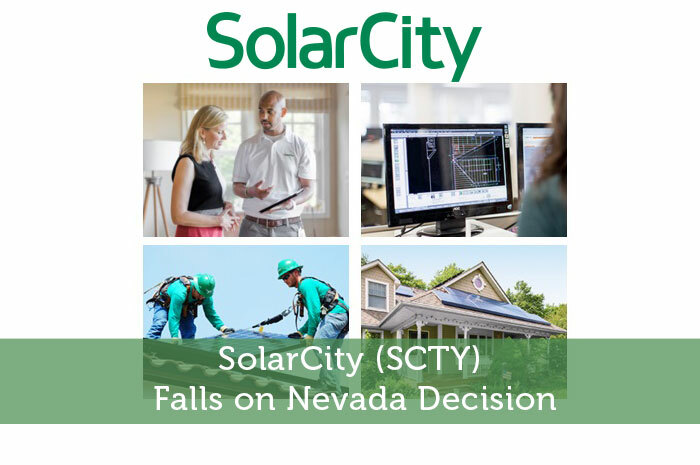 In fact, as a result of the decision, SolarCity as well as other solar companies have made the decision to cease installations in the state of Nevada. As investors, we know that any time we see negative news with regard to a publicly traded company or the sector a publicly traded company operates within, we can expect to see declines. That’s exactly what we’re seeing out of SCTY today as a result of the decision made by the Nevada Public Utility Commission. Currently (3:30), SCTY is trading at $37.26 after a loss of 12.86% so far today. Moving forward, I have a relatively mixed opinion with regard to what we can expect to see from SCTY. First and foremost, the news out of Nevada is horrible news for the company and the solar industry as a whole in the state. Because SCTY is no longer installing solar systems in the state, a large portion of the company’s revenue is now in jeopardy. As a result, I’m expecting to see more declines in the short term picture. However, in the long run, I see things turning out quite a bit different. The reality is that we’re seeing quite a few changes in the solar industry as a whole. It seems as though the sentiment with regard to solar as a whole is turning in the very positive direction. There has been two big stories as of late that are likely to increase the demand for solar systems. First and foremost, we saw a landmark climate change deal out of Paris recently. Under the deal, nearly 200 countries have made the decision to work to reduce greenhouse gases. As a result, these countries will have to reduce their reliance on fossil fuels, which will increase demand for solar and other renewable energy systems. Another big story is the fact that the United States has made the decision to extend a 30% tax credit that is being provided to consumers and businesses that install renewable energy systems. As we continue to see a tidal shift into the positive direction from this industry, we can expect to see further gains out of SCTY and other renewable energy stocks in the long run. Where do you think SCTY is headed moving forward? Let us know your opinion in the comments below!